High quality with attention to detail, the ANSI approved LWT attic ladder is made from quality pinewood assembled in three sections. The LWT attic ladder model is a super-thermo insulated unit recommended for projects that stress energy-saving due to heat loss. The LWT is equipped with a locking mechanism that is installed inside the insulated and sealed door panel. The length of the ladder may be adjusted within 1 inch after cutting the side rails to set the ladder evenly on the floor. Construction of attic ladder provides more steps (tread rise about 10 inches) to improve safety and comfort. A red, metal handrail is included and may be installed on either side of the ladder. Springs are located on door surface to make entry to attic wider and more comfortable (the widest entrance on market - compare to other products). Door is well balanced - it opens and closes easily (NO sudden movements). Fits rough opening 25 in. x 54 in. and ceiling heights 7 ft. 11 in. to 10 ft.1 in. This elegant, superior quality Fakro Insulated Steel Attic Ladder fits in R.O. 25-inch x 54-inch and ceiling heights 7 ft. 11-inch to 10 ft. 1-inch Durably built from powder painted metal, it is assembled in three sections and equipped with a locking mechanism installed inside an insulated and sealed door panel. The ladder length can be adjusted within 1.3-inch after cutting the side rails to set it evenly on the floor or if adjustment is needed following floor renovation. Twelve steps feature a tread rise of about 10-inch to ensure safety and comfort, while small, easy-to-grasp side rails along the entire staircase offer additional security, and brackets help increase space between the ladder and attic door for easy functionality. With springs on the door surface to make attic entry wide and comfortable, the door boasts a well-balanced design that opens and closes easily with no sudden movements. Attic Ladder (Wooden insulated ) LWT 25X54 300 lbs 10 ft 1 in High quality with attention to detail, the ANSI approved LWT attic ladder is made from quality pinewood assembled in three sections. The LWT attic ladder model is a super-thermo insulated unit recommended for projects that stress energy-saving due to heat loss. The LWT is equipped with a locking mechanism that is installed inside the insulated and sealed door panel. The length of the ladder may be adjusted within 1 inch after cutting the side rails to set the ladder evenly on the floor. Construction of attic ladder provides more steps (tread rise about 10 inches) to improve safety and comfort. A red, metal handrail is included and may be installed on either side of the ladder. Springs are located on door surface to make entry to attic wider and more comfortable (the widest entrance on market - compare to other products). Door is well balanced - it opens and closes easily (NO sudden movements). Fits rough opening 25 in. x 54 in. and ceiling heights 7 ft. 11 in. to 10 ft.1 in. 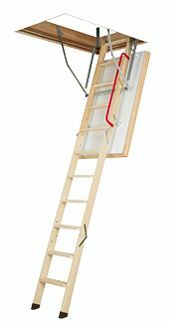 Attic Ladder (Wooden insulated ) LWT 25X54 300 lbs 10 ft 1 in is rated 4.1 out of 5 by 7. Rated 1 out of 5 by Jerry from WAY TOO EXPENSIVE, similar ladders exist for half the price. Insulation is overrated. WAY TOO EXPENSIVE, similar ladders exist for half the price. Insulation is overrated. Rated 4 out of 5 by Petey from Solid construction. Does the job. Latch a little awkward to... Solid construction. Does the job. Latch a little awkward to use. Rated 4 out of 5 by Mooney from Well designed, sturdy, and easy to install. Weatherstripping and the thick insulated cover seem l... Well designed, sturdy, and easy to install. Weatherstripping and the thick insulated cover seem like they will do a good job isolating and insulating the house interior from the attic, much better than other attic ladder products I found. However, the steps are smaller (width and depth) than I would have liked, and compared to other attic ladder products. The small steps are my reason for 4 stars. Note that if you use joist hangers when framing the rough opening, you should consider adding a half inch to the recommended rough opening length and width. Rated 5 out of 5 by ME from This attic ladder took about 3 hours to install. After installation and a little caulking there a... This attic ladder took about 3 hours to install. After installation and a little caulking there are no more air leaks. Well worth the money. Rated 5 out of 5 by Jeffrey from excellent sealing, insulation, and build quality. ... excellent sealing, insulation, and build quality. Rated 5 out of 5 by GT from Stairs arrived on time and in good condition. Pickup... Stairs arrived on time and in good condition. Pickup was quick and easy; store employees loaded stairs in my truck. Absolutely no complaints or problems.